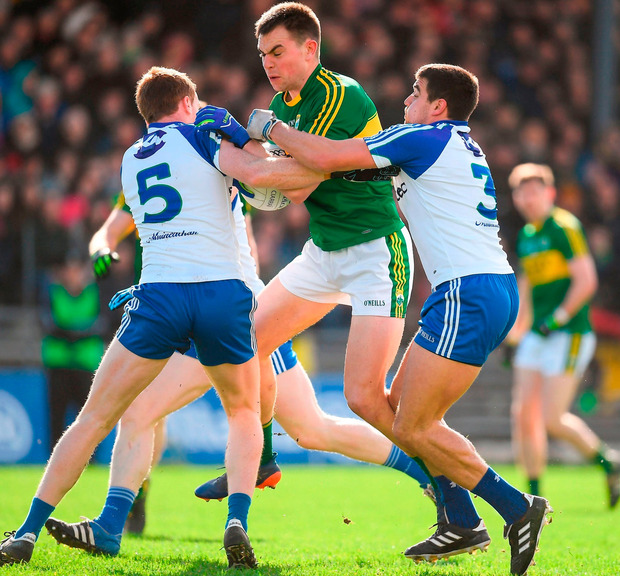 By the time the Monaghan-Kerry game starts in Clones tomorrow, it may be a straight knock-out test for Eamonn Fitzmaurice and his under-pressure squad. It’s only the second outing in a three-match series, but if Galway beat Kildare in Newbridge and Monaghan beat Kerry, the two All-Ireland semi-finalists from this group will have been decided. Galway v Monaghan two weeks later would settle the running order for the top two, leaving Kerry v Kildare in Killarney as meaningless as a January challenge game. Actually, less relevant, since a January game helps in the season-building process, whereas a dead rubber Championship tie in August would be the ultimate in pointlessness. It’s difficult to imagine the Fitzgerald Stadium turnstiles doing much business for such a unique non-event. And those Kerry supporters who did attend would, no doubt, be in a state of shock at how a season which promised so much ended in embarrassment. Of course, that scenario may not emerge, since a Kildare win over Galway would leave Kerry’s qualification hopes just about alive, even if they lost to Monaghan. Still, Kerry really are heading for a high-wire act in St Tiernach’s Park, where the vast majority of the crowd will be wearing blue and white. There has been a sense of giddy excitement in Monaghan all week as supporters enjoyed the build-up to one of the biggest games in the county’s history. Beating Kerry in the Championship would be historic for Monaghan and made all the most special if it were to book a place in the All-Ireland semi-finals. The last time Monaghan reached the last four was in 1988, when they lost to Cork. Three years earlier, they had taken the great Kerry team to a replay in the semi-final, a season in which they also won the National League title for the first time. The draw with Kerry still has a special place in Monaghan affections as the day they matched the best team in Championship history. The draw was secured in dramatic circumstances from the boot of Eamonn McEneaney, one of the best place-kickers of his generation, who pointed a 53-metre free late on. Kerry won the replay by five points. McEneaney and many of his colleagues were aboard again when Monaghan lost the 1988 semi-final to Cork. Still, three semi-final outings in four seasons show the standard Monaghan reached in that era. They have been at a consistently high level in recent times too, but unlike ’85 and ’88 when winning Ulster meant automatic All-Ireland semi-final qualification, their provincial successes in 2013 and 2015 took them to the quarter-finals only. They lost to Tyrone on both occasions, leaving them with the worst of both worlds, squeezed out for a semi-final place and also overtaken as the top team in Ulster. That’s part of the reason why Monaghan people are so excited about tomorrow’s game. It has all the appearances of a quarter-final (although a win would not guarantee them a semi-final place if Kildare beat Galway) and this time the opposition is Kerry rather than Tyrone. Also, it’s in St Tiernach’s Park. “It’s a huge opportunity for Monaghan. Having the game at home at a time when there’s uncertainty about Kerry is as good as you could ask for,” said McEneaney. Of course, it can also be argued that it’s exactly the wrong time to play Kerry. If they had beaten Galway as comfortably as the odds suggested, they might be a touch complacent tomorrow, presenting Monaghan with a chance to pounce. “I don’t think it would make any difference. Monaghan beat Kerry in the League last February so whatever happened against Galway, they would be very wary coming up here again,” said McEneaney. “As it is, they’re coming off a disappointing performance. It doesn’t matter who you are, your confidence is shaken when you play poorly. And with their survival in the Championship possibly depending on a win, the pressure in really on. There’s a history of a Kerry backlash after poor performances so the general view is that they will be a different proposition tomorrow. McEneaney agrees but questions how good Kerry are, especially against well-organised defences. “They have troubled them in the past and again last Sunday. Monaghan have got to make it as difficult for their forwards as they possibly can,” he said. That moves the focus onto Monaghan and the crucial question of their true status. It appeared to be of the highest quality when they finished third in the Division 1 table (they beat Dublin in the last game) in March before overpowering Tyrone in the Ulster quarter-final. A few weeks later, they scored just ten points when losing to Fermanagh, who were later well beaten by Donegal and Kildare. “It was hard to figure out what went wrong against Fermanagh. It was as if they were sitting back waiting for things to happen. It was the exact opposite of how they played against Tyrone,” said McEneaney. “The important thing was that they took the lessons from it and used them in the qualifiers. There’s more in them than we’ve seen yet. Even last Sunday, they weren’t at the peak of their powers against Kildare. “They still managed to win, which was great, but there’s no doubt they can play better. McEneaney, a former Farney manager, pinpoints two key requirements which must be fulfilled if Monaghan are to win tomorrow. “They must all step up together and it’s absolutely vital that they start well,” he said. “This is not a day for some – or even most – of the team playing very well. They need everyone to be on their game, whether it’s the starting team or the subs that come on. “And they must get it right from the start. If Kerry get a run on a team, they make it count. Galway didn’t allow them do that last Sunday and it’s vital for Monaghan to do the same. The big pressure may appear to be on Kerry but, in many ways, it’s just as heavy on Monaghan. Defeat would almost certainly leave them needing to beat Galway in Pearse Stadium this day fortnight to have a chance of reaching the semi-finals. It’s an achievable goal, but if they can’t beat Kerry at home, the odds would be stacked against them beating Galway away, especially if Kevin Walsh’s men need to win to maintain their bid for a semi-final place. McEneaney believes that could well be the case, pointing out that the tight confines of St Conleth’s Park will suit Kildare more than Galway tomorrow. “The fixtures have fallen nicely for Monaghan. Having beaten Kildare, they are home to Kerry, who took a heavy knock last Sunday, whereas Galway have to go to Newbridge. If Monaghan can reach four points this weekend, they will be in a very good place,” he said. Monaghan have beaten Kerry in three of their last four Allianz League meetings, an impressive record that will leave Malachy O’Rourke’s men quite confident that they can extend it into the Championship. “Monaghan have no fear of Kerry. Most of this squad have been together for a long time and are comfortable as a group. They know what a great chance they have to reach the All-Ireland semi-finals so you can imagine how motivated they are for this game. If they all step up together, they can win it,” said McEneaney. As well as taking them a step closer to the last four, it would mark the first time Monaghan had beaten Kerry in the championship, the draw in 1985 being their best result so far. And what of McEneaney’s 53-metre kick that brought them level that day? “No, it was 73 metres as far as I can recall,” he joked. Independent.ie Newsdesk Kildare need to get the better of the Tribesmen on home turf to have any hope of making the last four. Following the action at St Conleth’s Park from 2pm. Independent.ie Newsdesk Kevin McStay has accused some GAA referees and officials of lacking courtesy after Roscommon’s defeat to Donegal at Dr Hyde Park yesterday.